M.D. 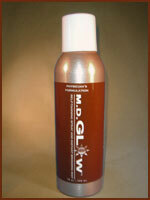 GLOW which is Body Bronze Self-Tanning Spray & Instant Bronzing Mist was finally launched in May 2008. It has taken us over two years to “perfect” the ultimate sunless tanning solution administered through an aerosol can and an additional 6 months to test with several physicians and aestheticians throughout the country. We were adamant not to sacrifice the reputation of our sunless tanning lotion just to provide a product that is highly in demand. Although the consistency is obviously different from our lotion, the results, the scent and the quality of the ingredients are the best on the market and an excellent addition to our product line. M.D. GLOW allows you to evenly apply self-tanning solution over the entire body and may be used to enhance abs, cover ellulite and stretch marks. This Instant Sunless Tanning Spray works like an airbrush tan and it creates a perfect golden tan, with no streaks, funky odor and fades evenly. This easy to use aerosol spray is light and airy and it goes on evenly and dries quickly for a tan that lasts. This clear self-tanning aerosol spray is a great product for those who would like a safe, healthy looking tan for the face without the risk of having clogged pores from a bronzer. The spray is clear, however coloration will appear in 2-3 hours. M.D. 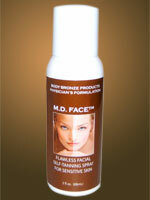 FACE is the perfect sunless facial tanner for people who have acne, age spots or any other skin imperfections that bronzers tend to emphasize.